Home / Unlabelled / Shopify vs WordPress - Which is The Best? Shopify vs WordPress - Which is The Best? When it comes time to begin selling your products or services online, the question of which e-commerce service is best always comes up. There are many great tools and platforms available, as both downloadable software and online tools, so choosing one perfect solution for everyone is nearly impossible. In order to narrow down your choices and decide which e-commerce tools best for you, you’ll need to weigh the options provided by the various tools and figure out which features work best for you. 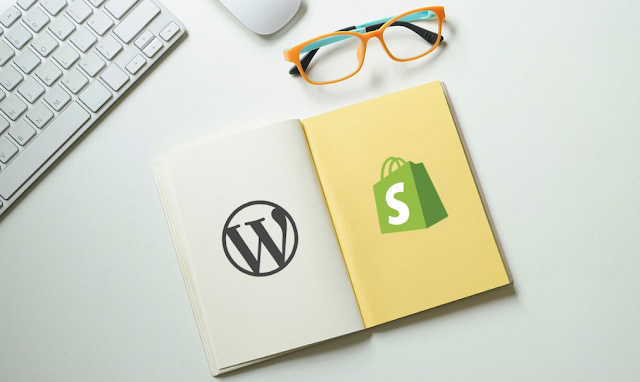 In this Shopify vs WordPress comparison, we will be looking at two very popular e-commerce platforms in an effort to help you see which one might be more suitable for you. Before going into too much detail, we will say that Shopify is often the better choice when compared with WordPress because it is built specifically for e-commerce purposes. The comparison is not cut and dry, however, and it’s good to keep in mind that a skilled WordPress user can do just as much, if not more, with e-commerce as a Shopify user can. Read on for more detailed information. WordPress, by nature, is not an e-commerce site. It is a robust, fully featured website creation platform that can be used for just about every type of website you can imagine. To turn a WordPress site into an e-commerce site such as the ones natively created by Shopify, it is necessary to go through a lot of steps to get everything set up just right. Shopify’s case is quite different, in comparison. Shopify, from the ground up, was built to facilitate online sales. Whether users are creating online marketplaces to sell physical goods, services, or digital files, Shopify makes it possible to set up a store with all the bells and whistles in a few short minutes. Pitting WordPress vs Shopify against one another in terms of which is the better e-commerce site is a rather unfair fight in most cases as Shopify is the easier, more convenient, and often times more secure platform for selling online. For anyone who is well-versed in WordPress and understands the way it works, it could be a better option to use WordPress as an e-commerce site despite the obvious lack of ease enjoyed by Shopify users. There is some comfort in using a familiar system, and when used in the right way, WordPress can certainly be a very powerful e-commerce platform. The answer, of course, is in both the hosting and the plug-ins that are available. Once a host has been established in the WordPress software has been installed, WordPress users should grab plug-ins to handle e-commerce features such as store details, product descriptions, payment gateways, etc. Most users will benefit the most amusing Shopify, as we have already alluded to. The combination of features on offer make this an easy choice. It is possible to have an online store up in mere minutes from signing up and paying for a subscription on the Shopify website. Subscription costs range from $9 to $179 per month, there are never any coding skills required, there are many professional themes to choose from, SEO and marketing tools are baked right in, 24-hour support is available, and the list goes on. As you can see, the majority of e-commerce site users would most likely opt for Shopify over WordPress when it comes to building their online store. The choice simply comes down to how much faster and easier everything is Shopify. While it’s true you can do the same with WordPress, the amount of work it takes to match the capability of Shopify is so much more involved than it really only makes sense to existing WordPress users who know the system very well.